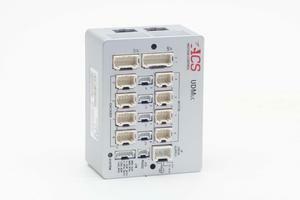 UDMlc - a line of small footprint EtherCAT modules with dual / quad axes, cost effective universal drive for small motors. It's primary goal is to address applications that require multiple motors in the range of up to 200W (e.g- inspection heads, table top motion stages), where space is limited. Current levels: 1.25A/ 2.5A; 2.5A/ 5A; 5A/ 10A (Cont./ Pick). Power BUS input 12V - 48V, and seperate logic supply 12 - 48Vdc. Panel or din rail mountable.